Each hinge is created from pure wrought iron, and hand forged by the hands of our master blacksmiths. These are large, 14", hand forged door hinges featuring decorative finials and a grease ZERK fitting. All of our products are handcrafted in the USA from the highest quality, all natural materials. Like everything that comes out of our factory, these hand forged door hinges are created custom, made to order by our world class master craftsmen. 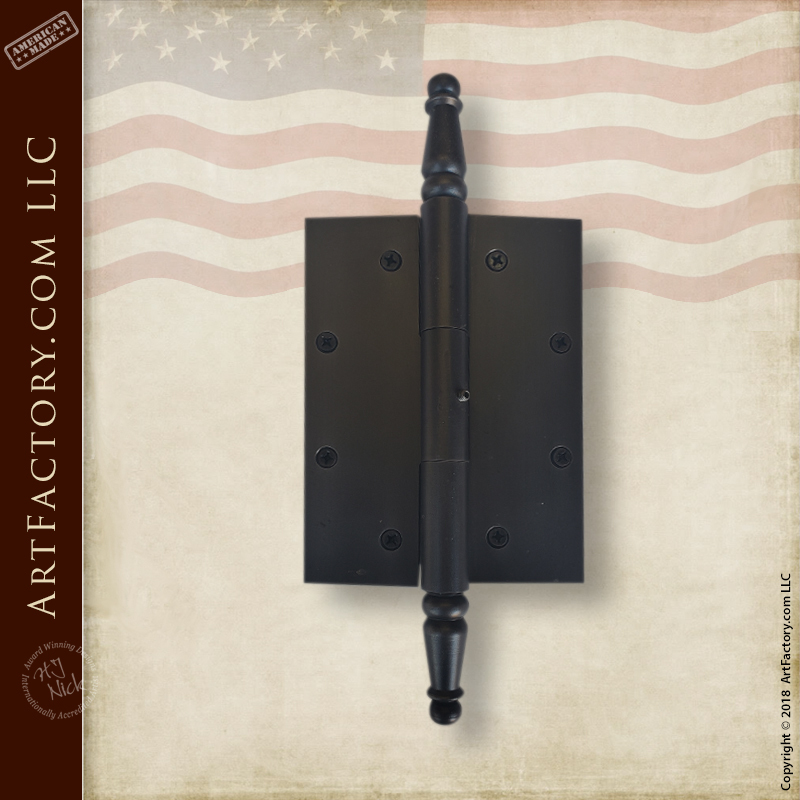 Every product from ArtFactory.com is made using old world techniques and materials to assure that your product is both historically correct, and built to stand the test of time. 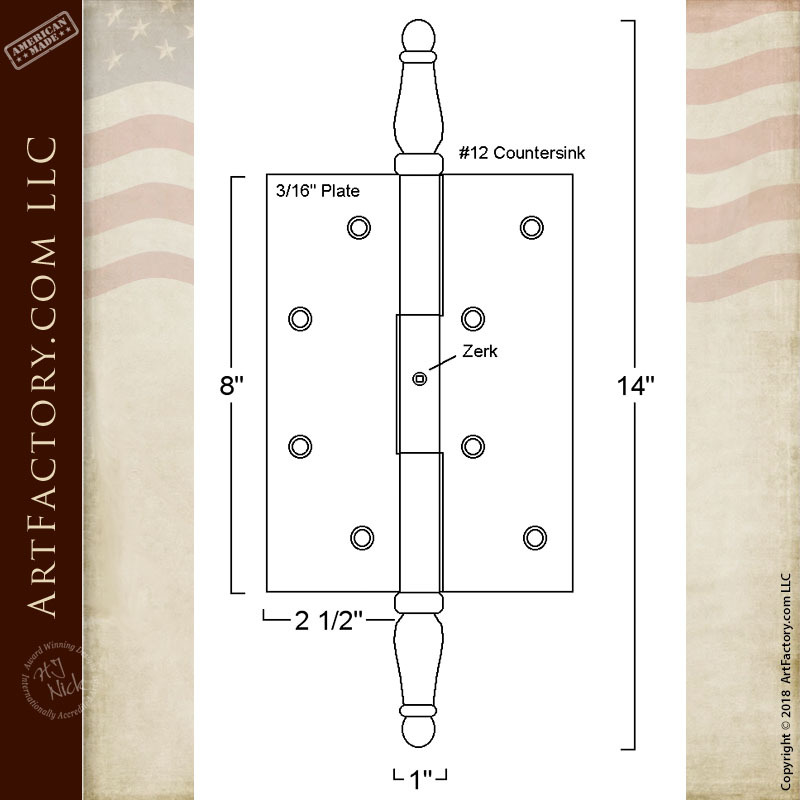 We create fine art quality, wrought iron door hardware that is custom designed for your residence or business. Any of our designs can be personalized to your exact request, thus allowing us to create an item that is uniquely yours. Our theme door pulls are the perfect way to make a first impression that reflects your personality and accomplishments. Furthermore, all our hand forged door hinges and custom door hardware items have been advance patina finished. This process infuses a hand applied, iron oxide patina to the metal at over 1000 degrees Fahrenheit. This bonds the color to the molecules of the metal and advances the natural oxidation process of the metal. All of this adds up to a finish that is virtually maintenance free, and will last forever. These custom hand forged door hinges are coal fired, and anvil hammered into shape. Each item that we create is a unique design inspired by old world architecture. Award winning artist H.J. Nick travels the world in search of inspiration for his designs. This allows him to get up close and personal with historic castles, and buildings so that he can observe how, and with what materials these masterpieces from history were made. He then brings this knowledge back to our world class factory, and uses it to create the custom fine art designs that you see throughout our catalog. These designer hand forged door hinges can be custom fabricated in any color. You can order from our online catalog of door hinges, handles, and hardware, or send in your own drawing or photo. We can also build any specific design inspired by history. Call today to speak with one of our talented design engineers at ArtFactory.com. 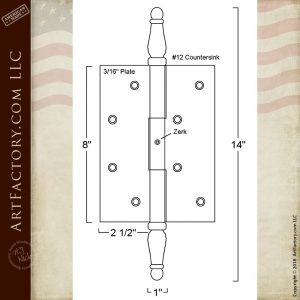 Never settle for the rest when you can have the best, hand forged door hinges handcrafted at ArtFactory.com are handcrafted uniquely for you. Request pricing on your custom door hardware by calling 1-800-292-0008.